Oklahoma City University, School of Law, 2006 J.D. University of Utah, Salt Lake City, Utah, 2002 B.S. 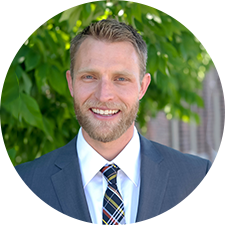 Tyler Young is a partner with Young, Kester, Black & Jube and has been in practice since 2006 in Provo, and Park City, Utah. Tyler’s practice and expertise focuses on insurance litigation which includes auto accidents, bad faith of insurance companies, medical malpractice, wrongful death and other injury cases. He has successfully litigated multiple jury trials, as well as arbitrations, and has extensive experience mediating cases. In addition, Tyler has had successful appeals to the Utah Court of Appeals and the Utah Supreme Court. Tyler was selected as one of the National Trial Lawyers top 40 under 40 in 2012. In 2013, Tyler accepted a nomination to the board of the Utah Association for Justice, an organization dedicated to promoting individuals rights, including the right to trial by jury. On two different occasions, Tyler has had the pleasure of teaching American Jurisprudence to Ukrainian college students with the Leavitt Institute in Kiev, Ukraine. In 2012, Tyler was selected to attend Gerry Spence’s Trial Lawyer’s College in Dubois, Wyoming, where he worked directly with Gerry Spence, a celebrated trial lawyer, and other talented trial lawyers from around the United States. The trial college focused on advanced trial tactics and as part of Tyler’s commitment to the College, he vowed to only represent those who are taken advantage of by insurance companies, large corporations or governments. Tyler played college baseball at Utah Valley University where he received an associate of science in 2000. In 2002, Tyler graduated from the University of Utah in Finance and in 2006 graduated from Oklahoma City University School of Law. In his personal life, Tyler is an avid outdoorsman and enjoys the sport of triathlons and marathons. In 2010, Tyler was elected President of the Springville Rotary Club and was able to organize a half marathon and 10K race that raised more than $20,000 for charity. As a dedicated Rotarian for the entirety of his professional career, Tyler donates a portion of every settlement to Rotary charities. Graduate of the Trial Lawyers College founded by Gerry Spence – A college that focuses on helping individuals fight big government, insurance companies and large corporations.